Several years ago, on a South Dakota forum, a self-described “liberal” posed the question, what should be the role and size of government? His perspective was intended to be provocative, as the forum is mostly populated by a mix of conservatives and libertarians (though of the “minarchist” persuasion). I was asked to respond to his provocative viewpoint, and quickly whipped up about eight pages (12-pt, Century Gothic, single-spaced) and then edited it back to about six, trying to write from a minarchist viewpoint. Although incredibly lengthy, the response was “well-received” and several people who read it claimed that it changed their views on government and what the role and size should be. Why minarchist? Although I am a free-market anarchist (or “self-governor” as Mama Liberty prefers), I can see the need to argue for minarchy, as being better than the mess we have to live with now. But looking back, the real question is the title of this article. IS there an acceptable size and role for human government? As I grow older and more experienced, and as conditions get steadily worse in America and around the world, the answer becomes clearer. 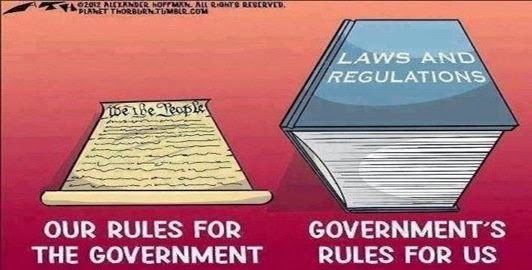 I more and more believe and argue that the proper size of government is zero – or so close as to never matter. That is, government defined as involuntary, geographically-based, holding a monopoly of armed power (or close to it), and human-originated. I disagree with other anarchists because I think that voluntary government (as found in the churches founded and described in the New Testament) is not unacceptable, being voluntary, with incredibly restricted “powers” and “authority” and having, of itself, NO armed power. Provided it has no ties with involuntary government and no religious hierarchy, but is limited strictly to a local congregation or parish or assembly. Modern human life and society need government – mandatory, “monopoly of force” government – just as much as we need god-kings, religious hierarchies, human-sacrificing religions, ceremonies to make sure the sun comes back after an eclipse, jack-booted thugs, and to use an old Texan expression, “teats on a boar hog.” There is NO acceptable size or role for involuntary government. It is a curse on mankind, on our liberty, our families, our societies, our businesses, our happiness (or pursuit thereof), our property, and our lives. We’ve had this situation before: Not just with government, but with OTHER institutions that were “part of the natural order.” Things like being slaves in Egypt, living under the thumb of the Seleucids, cowtowing to that “successor to Peter” in Rome, living under English occupation in the Scottish Highlands, having to give up sacrifices to the bloody-handed priests in Ciudad Mexico, and many others. Over the milennia the human race (or at least a good part of it) have given up on such things as human slavery, cannibalism, human sacrifice, and god-kings (although all of these ancient evils seem to reappear a LOT more often than we’d like). It is time to add involuntary government to that list. This entry was posted in Nathan's Rants and tagged government, human government, limits on government, role of government, size of government. Bookmark the permalink.